UNITED NATIONS, December 19 -- Since Herve Ladsous was put in charge of the UN Department of Peacekeeping Operations, as the fourth Frenchman in a row in the position, he has given a single press conference in New York, dodged a question on Haiti at one stakeout, and canceled a December 19 stakeout. At the stakeout at which he refused the Haiti question, he claimed that DPKO would "immanently" sign a Status of Forces Agreement with Sudan for its mission in Abyei. But that didn't happen immanently, and a representative of Ethiopia, the troop contributing country, told Inner City Press last week that it still hasn't been signed. Ladsous has not explained. The working theory is that while the UN had interviewed and offered the top DPKO job to French ambassador to India Jerome Bonnafont, when his bragging about getting the job was reported by the Press, the UN balked. 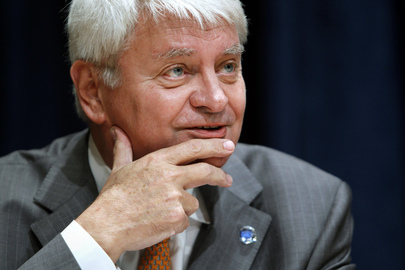 France says it owns the top DPKO job and so gave it to Ladsous, who so far is widely described as underwhelming and unprepared. Earlier on December 19, Inner City Press had asked the UN about a NRC report stating, as to DPKO "integrated" missions, that "Some NGOs in Afghanistan, DRC and Somalia deliberately distance themselves from the UN in order to ensure acceptance for their own actions." Inner City Press: there is pretty detailed study that has been put out by the Norwegian Refugee Council and it talks about this idea of [Department of Peacekeeping Operations] of having integrated missions in which humanitarian and others work alongside peacekeepers and the political arm. And they say that it is leading to a rift between humanitarian [non-governmental organizations] and the UN, that there is a growing hesitancy within part of the [non-governmental organization] community to engage with the UN, including sharing information, joint assessment and joint field visits, because of the perception that the UN has taken sides or they, by going with the military component of the UN, they are no longer independent humanitarians. And it seems like it is a pretty damning critique from a pretty respected [non-governmental organization], and I wondered if the UN is aware of it and if it has any thoughts on either how to mitigate those harms or thinks that it is inevitable. Associate Spokesperson Farhan Haq: Well, we are aware of the report. I imagine that we will need to study it to make a fuller response. In terms of the independence of humanitarian workers, though, one thing I would like to make clear is that the United Nations does respect the independence of humanitarian workers. It is vital to their effort, and certainly in our own humanitarian work, we try to make sure that that work is done independently of other considerations. Question: Do you think [Office for the coordination of Humanitarian Affairs] or [Department of Peacekeeping Operations] or one of them will actually have a kind of either a response to this study or at least sort of a statement on the issue of integrated missions harming humanitarian work? Associate Spokesperson: Well, I don’t know. First, I think they’d need to review and see what sort of reaction is appropriate. Haq had begun the December 19 briefing by announcing that "Mr. Ladsous, accompanied by Mr. Kubis, expects to speak to reporters at the Council stakeout following today’s meeting." In neither format was any explanation given. And so it goes at the UN. Footnote: Even Kubis, the new envoy to Afghanistan, did not go to the stakeout. Inner City Press found him outside the Security Council and asked if it was aware of and would pursue the case of Louis Maxwell, a UN staff killed reportedly by Afghan national forces. Kubis said, "I am aware of it;" he did not say he would pursue it, as his predecessor had said. We'll see.